10 Health Benefits of Bananas - Banana is a tropical fruit that is a favorite of many people. In addition to the sweet taste, bananas are also rich in vitamins and minerals, can be eaten directly or processed into a variety of delicious dishes. By eating a banana, you can satisfy the desire to eat something sweet without damaging the diet. The average banana contains 110 calories. Banana is a fruit that is free of fat and cholesterol. The fruit is very famous for its potassium content. With potassium levels reach 400 mg in a medium-sized banana, the fruit must be consumed to maintain a healthy heart. Potassium is also known to be very good for muscle and nerve function, and maintain fluid balance in the body. Potassium in bananas is also suitable to be consumed to prevent muscle cramps after exercise. As with other fruits, bananas are also rich in vitamin C. One banana contains about 10mg of vitamin C, or about 15 percent of the daily vitamin C recommendation. B vitamins are usually found in animal products, but the banana was also a source of vitamin B6 called pyridoxine. One banana provides 35 percent of the daily recommendation of vitamin B6. The body uses these vitamins to regenerate new cells. Manganese is a mineral needed for healthy bones and metabolism. One banana contains 3 mg of manganese. One banana contains about 3 grams of fiber. In addition to healthy digestive tract, fiber also we need to keep the stomach feel full longer. There are several types of minerals and vitamins contained in bananas, although the numbers are small, ie, magnesium, calcium, phosphorus, vitamins A and E, folate, carotenoids, and amino acids. The body uses carbohydrates as the main energy source. Eat a banana after a workout to restore energy. A banana after breakfast is also recommended to keep a supply of energy to survive until lunch time without a snack. Bananas are easy to digest. 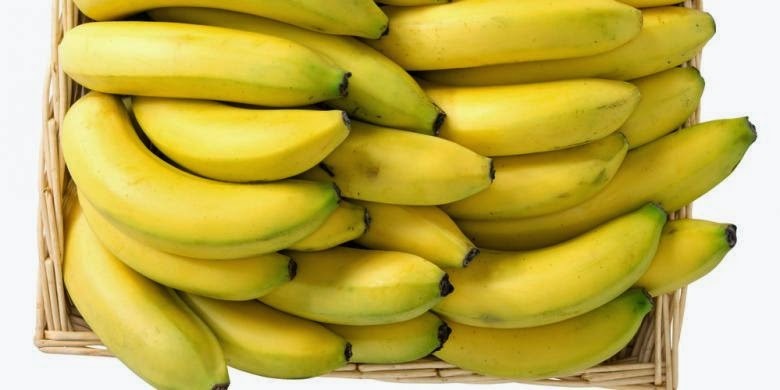 When you're suffering from a viral illness or indigestion, bananas are very suitable as a source of nutrition without making digestive work too hard. Bananas are also frequently used as a pulverized solid foods are introduced to infants.